Chef Marshall’s foray into cooking began at Whole Foods Market in Colleyville, Texas, where he learned the art of creating pizzas under the influence and guidance of Pizza Master, Vollero Mario. Chef Marshall continued to fuel his passion for food as he worked at a small family-owned Italian restaurant named Mio Nonno. 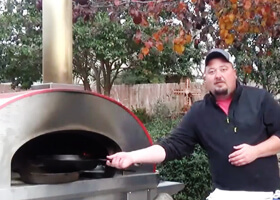 It was at Mio Nonno that Chef Marshall embraced the world of handcrafted pizza creation. He experimented with dough-making until he discovered the perfect combination of ingredients that resulted in award-winning flavor-infused breads and pizza. Forno Bravo joins Chef Marshall as he continues his journey in dough creation as a private caterer and Executive Chef at the renowned Carmela Winery, where his enchanting breads and pizzas unify people from all walks of life, as they share a delectable epicurean experience.